commongunsense on But for the guns…..
Mark on But for the guns…..
Post categories Select Category “gun control” #WearOrange Affordable Care Act American election Animal rights Charlottesville alt right protest Climate Change Colorado Springs Planned Parenthood shooting Domestic shootings Gun Safety Reform Gun Violence Prevention Hurricane Irma Marriage Equality Million Mom March National Gun Violence Awareness month National Suicide Prevention Awareness week Natural disasters Paris terror attacks Political debates Terror attacks Thanksgiving celebrations Timothy Egan Uncategorized Wildfires in Western U.S. The irony of the gun lobby "logic"
Blogging for gun safety reform and changing the conversation about the role of guns and gun violence in our communities. Common sense gun laws and gun safety reform and gun rights are not mutually exclusive. But Republicans who control the state Senate, with support from three DFL senators, rejected Latz’s bids to attach the two amendments to a wide-ranging spending bill that the Senate considered on Thursday. The bill dedicates nearly $20 million for schools to hire counselors or school resources officers, update building security and develop mental health programs. It also increases the frequency of school employee background checks and provides grants for schools to audit their security. The Senate votes were the biggest test to date of whether gun control supporters at the State Capitol could seize political momentum from the renewed national debate over guns in the wake of the Parkland, Fla., school shooting, where 17 people were killed. Lawmakers across the nation have been considering similar gun regulations, and a recent Star Tribune Minnesota Poll found that 9 in 10 Minnesotans favor mandatory universal criminal background checks. “Could gun legislation be something where the NRA supports it and it actually could help keep guns out of the hands of violent criminals? That’s the sort of thing we would need to look for,” said Daudt, who said he personally does not support universal background checks or the temporary removal of firearms, known as “red flag laws” or extreme risk protection orders. Daudt said he sees no scenario where further gun restrictions pass in Minnesota this year. Other studies show that gun owners strongly support more gun-safety regulations, including a federal database of gun sales, banning people convicted of domestic violence from owning guns and prohibiting ownership by those with a mental illness. It’s not about rights and the second amendment. It’s about keeping our communities safe from the devastation of gun violence. But nevertheless, they persist in their lies and innuendos. 2000 gun rights advocates gathered at the Minnesota Capitol yesterday, many armed. Were they afraid of each other? Why armed? To make the point that the “guys with the guns make the rules.” What rules? Lee said that he and other NRA leaders, including Wayne LaPierre, “were heartbroken over the senseless murders” in Parkland, but that gun-control supporters had exploited the shooting. “The ‘antis’ most recent tactic is to use the un­developed emotions of children to advance their cause,” he said. Katie Peterson, a 25-year-old graduate student at the University of Minnesota, came to the rally carrying a sign and wearing an NRA hat. She said she recently became a gun owner and felt it was important to show up and support the Second Amendment. She said that having a gun would have helped protect her during a domestic sexual assault she experienced. But the available evidence does not support the conclusion that guns offer women increased protection. Myriad studies show that the NRA and its allies grossly misrepresent the actual dangers women face. It is people they know, not strangers, who pose the greatest threat. There is also strong, data-based evidence that shows owning a gun, rather than making women safer, actually puts them at significantly greater risk of violent injury and death. Women who were victims of attempted or completed crimes used guns to defend themselves just 0.4 percent of the time, according to the National Crime Victimization Survey. (The survey uses a representative sample of 90,000 households in order to estimate national crime rates.) A Harvard study found that, of the more than 300 cases of sexual assault reported in the sample of NCVS data between 2007 and 2011, none were stopped by a firearm. Of the 1,119 sexual assaults reported in the NCVS from 1992 to 2001, a different study revealed that only a single case was stopped by defensive gun use. And, as we have shown in previous articles, even these numbers from the NCVS likely overestimate the true rate at which women protect themselves with firearms. None of the measures proposed would take away anyone’s second amendment rights. If they want their guns, have at it. But let me just say that if that is the case, you may be rolling the dice against yourself or your family because the chances of your needing that gun for self defense are minimal compared to the chances of being shot or using the gun to shoot someone while in your home- as in a domestic shooting or a suicide or a child finding that gun and using it “accidentally” to shoot him/herself or someone else in the home. The latest data show that people use guns for self-defense only rarely. According to a Harvard University analysis of figures from the National Crime Victimization Survey, people defended themselves with a gun in nearly 0.9 percent of crimes from 2007 to 2011. David Hemenway, who led the Harvard research, argues that the risks of owning a gun outweigh the benefits of having one in the rare case where you might need to defend yourself. Even if someone wanted to use a gun in self-defense, they probably wouldn’t be very successful, says Mike Weisser, firearms instructor and author of the blog “Mike The Gun Guy.” He says many people who carry a gun aren’t properly trained to use it in this way, and there is no performance validation standard for police officers. But never mind the facts. The die is not cast yet. Gun safety reform advocates were present at the Capitol all week showing support for a sit-in supporting passing a few life saving measures. The point was made but legislators chose to close their eyes and ignore what their constituents want. Common sense tells us, along with strong public opinion, that passing background check and extreme risk protection orders will not result in gun confiscation. The truth of the matter is that most gun owners undergo background checks anyway when purchasing guns from licensed dealers. Have their guns been confiscated? No. The truth of the matter is that extreme risk protection orders will save lives and only temporarily remove guns from people who are clearly a danger to themselves or others. Remember the Nashville Waffle House shooting? Remember the Isla Vista shooting? Remember the Wisconsin Azana spa shooting? 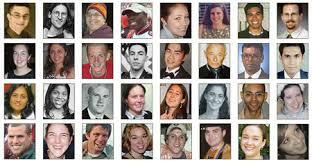 Remember the Virginia Tech shooting? Memories are short apparently. And it’s too late once another person who should not have had a gun in the first place either shoots strangers, loved ones or him/herself in a state of anger, domestic abuse, severe mental illness, etc. Why not prevent shootings in the first place? We already know that guns are not the first answer to preventing shootings. Check out the “hero” in the Nashville Waffle House shooting. But the gun rights advocates are sure that their just being at the scene as if unfolds will assure that they will save the day. The fact is it just doesn’t happen. The Sutherland church shooting ended when the shooter left the scene. A gun owner pursued him and shot him but did not prevent the shooting in the first place. Another small minority of Americans have permits to carry guns. Just having the permit does not mean the person will be carrying that gun wherever they go on a daily basis. In fact, many people have the permit as a way to legally purchase guns and just to have it. Carrying a gun around is inconvenient and a burden on the person carrying. Permit holders do actually make mistakes- sometimes deadly, sometimes not. “Accidentally” shooting someone you know or love is inexcusable and avoidable. Leaving loaded guns around where others can find them is avoidable and senseless. 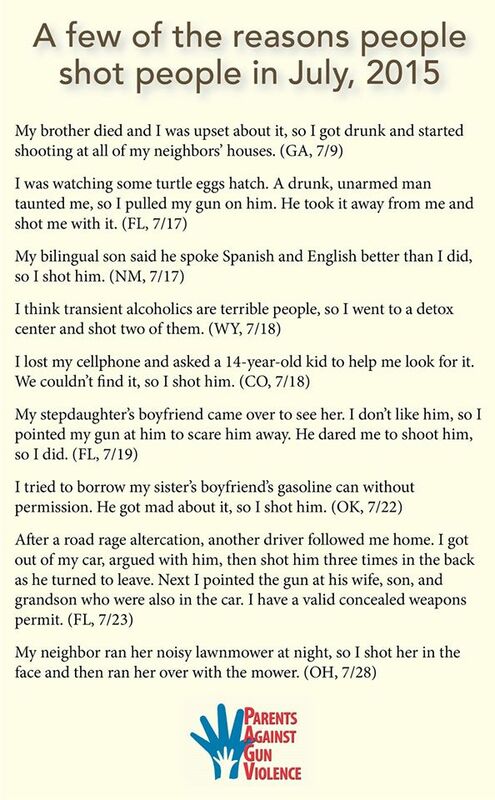 There should be no “mistakes” or “accidents” with guns. They are deadly weapons designed to kill people. Check out this, this, this and this for just a few. With rights come responsibilities. The “game” needs to be played fairly with the facts at hand and with the idea in mind that representing one’s constituents really does mean playing the hand on the side of gun safety reform. The Minnesota legislature may have won a pyrrhic victory but they have not won the game. The cost is in human lives. The cost may be too great to sustain. Losing seats in November may the cost. Time will tell. Our priorities are all screwed up. I could use another word here because that is how I really feel. It turns out that the Department of Defense has been abrogating their duty when it comes to sending the names of military members who have become prohibited gun purchasers to the FBI’s instant check system. And Congress has been sitting on their butts doing nothing about the increase in gun deaths in America. So 3 cities decided to take matters into their own hands by suing the Department of Defense. That seems to be the way things get done in this country. Rather than doing what makes common sense our leaders are waiting for an order from on high ( NRA and Wayne LaPierre) before they can do the right thing for public health and safety. New York, San Francisco and Philadelphia said in court papers that the military’s broken system for relaying such information helped spur the massacre of 26 people inside a Texas church last month. Earlier this month, the Pentagon’s watchdog agency said it found a “troubling” number of failures this year by the military services to alert the FBI to criminal history information. Attorney General Jeff Sessions has ordered a review of the FBI database. There is no reason why insisting that the military branches send these records to the database so people can be denied gun purchases should be a problem. It would only be enacting laws already on the books. This is not an issue of the second amendment or gun rights. Yet, somehow it feels like it might be. It really is past time to do what’s right for the American people. 26 people were killed in Sutherland, Texas while attending church one day in early November. If the military had followed the rules and sent the criminal records of the shooter to the FBI database, it is likely the shooting would not have happened. But then again, there is that gap in the law that would have allowed the shooter to go to a gun show or on-line site to buy guns with no Brady background check. But we can’t go there. If we don’t go there, we can expect the carnage to continue. If one of your family members or friends had been shot by someone who could have been stopped, you would be pretty angry. Congress should be angry. Are they? There is no evidence that they are. Mass shooting after mass shooting continue unabated with no action from our leaders. it is an American tragedy and a refusal of Congress to keep us safe from harm. Where does it say anywhere that people have a right to shoot other people with no reason? I haven’t seen that anywhere. And can someone please tell me why the totally reasonable common sense legislation to ban bump stocks after the Las Vegas shooting didn’t go anywhere? Only Congress can explain this. Please ask them to do so. More than troubling. Total abrogation of a duty to keep us safe from harm. There have been 340 mass shootings this year according to the Gun Violence Archive, unless another few occur in the next few days. Remember the dangerous “default proceed” written into the FBI system when the Brady Law was enacted? The victims and survivors of the Charleston church shooting do. This is another abrogation of our duty to protect people from harm. The NRA tried to excuse this loophole by claiming it was a “safety valve”. For whom? This is beyond crazy ( see below). A 38-year old woman and her two children were killed and a police officer was injured in Christmas Day shootings at a Phoenix apartment complex. Anthony Milan Ross, 45, the woman’s estranged spouse and the father of the children, was taken into custody shortly after 10 p.m. Monday after exchanging fire with officers after a six-hour standoff, Phoenix police said Tuesday. Ross did not appear to be injured. For hours, residents and visitors inside the complex were not allowed to leave and those waiting to return to their homes were not allowed in. Power was cut to the complex about 7:30 p.m., and residents near the gunman’s apartment were escorted out by police SWAT team members. Yes, “it’s beyond crazy.” Every day we let this happen is beyond crazy. It doesn’t have to be this way. But this is the gun culture we have. There is no question that we can make simple and even difficult changes if we really care more about saving lives than making profits off of the sale of guns. Remember that guns are the only product designed to kill people and also the only product not regulated for safety by the Consumer Product Safety Commission. The way things are going in America, that will likely change as the Trump administration de-regulates everything. There are regulations for a reason. Our public health and safety should be at the top of the list of responsibilities for our leaders. Excuse me for being cynical that this is the case. The very least we can do is to follow the laws on the books to save a few lives here and there. If that life is someone you know or love, that would be of the utmost importance to you. 2018 is around the corner. If there is any logic at all, we should make a pledge to work together to save lives and reduce and prevent gun violence. Demand that our Congress members get a spine and stand up for what is right. Preventing the public health epidemic of gun violence should be a top priority for our leaders. If it is not, they should be looking for a new line of work. On Thursday of this week, my local chapter held a vigil on the 5th anniversary of the Sandy Hook shooting. Since we had a dozen co-sponsors who helped us spread the word about the vigil, attendance was higher than expected. Participants sat in the sanctuary of a local church listening to beautiful piano music played by a friend as slides with the faces of the 20 children and 6 adults massacred 5 years ago looped in front of them. Earlier this fall, we held another vigil for the victims of the Las Vegas shooting, equally well attended and a solemn reminder that real people lose their lives every day to gunshot injuries. At that vigil, we said the names of each victim and rang the bell 58 times. It was moving to say the least. A local reporter asked me in an interview before the vigil why we would hold a vigil for mass shooting victims when they happened so far away. My response? I don’t suppose the families of those small children expected that it would happen to them or in their town. I don’t think the residents of Sutherland, Texas imagined that it could have happened in their town. I never imagined that gun violence would affect my family. That is why we do this. There were vigils all over the country sponsored by Newtown Action Alliance and many other national gun violence prevention groups. The reason I mention that vigil is that only 2 months ago, we held a vigil for the victims of the worst mass shooting in our country. And then the church shooting in Sutherland, Texas happened in November taking the lives of another 26. There were slides with photos of those victims as well as their names on the screen as well. It was sobering, moving and powerful. After remarks from the pastor of the church urging peace and reminding us that, for Christians, this is the season of lighting advent candles to remind us of the reason we celebrate Christmas. But there were people of all faiths in the sanctuary including the local Rabbi, the Quaker community and those who don’t practice with any faith group. As the participants lined up to light candles in memory of the victims of all gun violence and in particular the victims of the Sandy Hook shooting, the photos continued looping. It was seeing those happy faces of those 20 first graders that caused the tears and emotion as the candles were lit. Many of us also lit a candle for our own personal loss of a loved one and there were a number of victims in the sanctuary who cried over their own loss as well as the losses felt by way too many Americans. As the vigil came to a close, we asked to honor the victims with action. That action included signing over 300 postcards that were mailed to our Congressional delegation urging them to support bills that would expand Brady background checks to all gun sales- something that makes so much common sense that 90-95% of Americans agree. We have had enough. That was the overwhelming sentiment at our vigil and vigils all over the country to mark this particular anniversary of the Sandy Hook shooting- the one we thought was even too much for our lapdog politicians. Alas, none of these mass shootings are enough. In fact, the stunning fact that 51% of Americans think that in order to protect gun rights, some mass shootings are OK with them. This sad fact should make us wonder what in the world is wrong with us. These shootings just don’t happen anywhere else in the world in such large numbers or at all, actually. About 61 per cent said the country’s gun laws should be tougher, while 27 per cent would rather see them remain the same, and 11 per cent want them to be less strict. That’s similar to the results of an Associated Press poll in July 2016. What is happening in our country is just not normal. Nor is it inevitable. It is preventable. It is avoidable. It is lunacy itself. 5 years later, the victims’ families reflect on what happened and, of course, are still haunted by that day that changed their lives forever. The ripple effect of gun violence spreads far and wide. It is an American tragedy. Something needs to change. We will not be held hostage by the corporate gun lobby. As two of my friends who attended our vigil said, they both have granddaughters in first grade. Seeing those smiling faces hit home for them about how it would be if one of their own was massacred so violently and suddenly by a crazed person with a gun. The enormity of our gun violence epidemic is very personal. Say their names. Look at their photos.